Lord knows, there isn't much style out there anymore. Maybe in the big cities, but that's about it. Everywhere you look it's sweatpants, bulging midriffs, too-tight tops, dragged back or unkempt hair, 50s makeup (and hairstyles, I kid you not!) - you know what I mean, right? This little book will help you tap into your inner stylish self. You can be stylish, believe it or not. We all can if we put a little effort into looking and feeling better about ourselves. 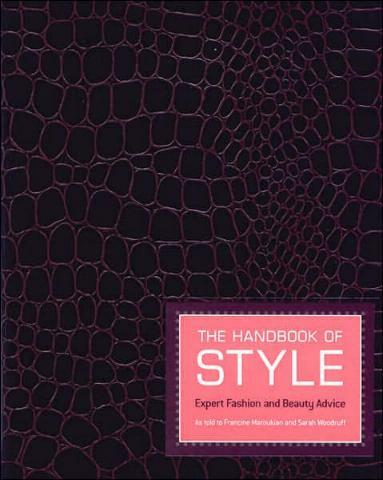 Authors Francine and Sarah compiled this book by getting tiptop hints and tips from experts in the hair department, makeup department (eyelashes, makeup brushes, eyeglasses), etc. They cover things like self-tanning, little black dresses, bras (a great bra makes all the difference), shoes, hats, bags, how to choose the perfect t-shirt or contemporary white blouse, how to buy and care for cashmere (far too much trouble for my liking), thongs, how to purchase vintage jewelry, how to travel and arrive in style, and so many more well worth considering style aspects. I agree totally with "all experts agreed on: When you find the right stuff, buy in multiples". My advice is primarily to learn what you can and cannot wear - not everything is for everyone. Conclusion - A comprehensive and definitive guide to style.